Managing a space as big as a warehouse requires smart thinking. As your business grows, you have to anticipate abrupt increases in production, too. Even if you manage to keep sales and production break-even, there’s still a chance inventory is going to swell at some point as order and distribution struggle to catch up, especially during peak seasons. 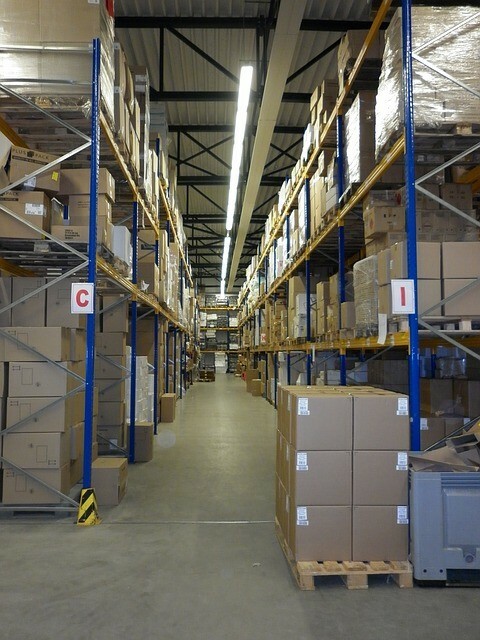 Make sure that your warehouse is ready with enough storage space to cope with the surge. At the same time, you have to reinforce your fleet to prevent delays in outbound delivery. The last thing you need is a bottleneck in inbound delivery just because your storage space is near bursting point. Unfortunately, the size of your warehouse isn’t as easily expandable as the rest of the facets of warehousing. It would normally take weeks or months of planning and budgeting to extend your warehouse’s space or build another one. Sometimes, this renovation may even disrupt your operation and cause the bottleneck that you’ve been trying to avoid. Most business owners would almost immediately resort to building an extension or a new warehouse without looking into other more efficient options. Not only will this cost your business several months’ worth of profit, but it can be a source of downtime as well. In truth, there are still a few other resources that you can exhaust before making such a staggering outlay. The first thing you should do is to determine the actual size of your warehouse and how much of its space you are actually utilising. You might be surprised to find out that no matter how cramped your warehouse’s interior may seem, you are actually only using roughly 60 percent of its available space. The other 40 percent comprises the area between the top of the racks and the ceiling. While it may seem unlikely, this space is indeed usable. If you have an in-house architect or civil engineer, ask them to determine whether or not it is possible to build an additional floor. This is perhaps the smartest way to maximize that space. Instead of having a pallet racking system that towers through the ceiling, you can choose to have another storey. Does adding a new storey make financial sense? It can be tempting to consider adding a floor to your existing building given the situation. Especially if the warehouse has a high ceiling, a new storey could certainly make a difference. It can make your building more space-efficient. 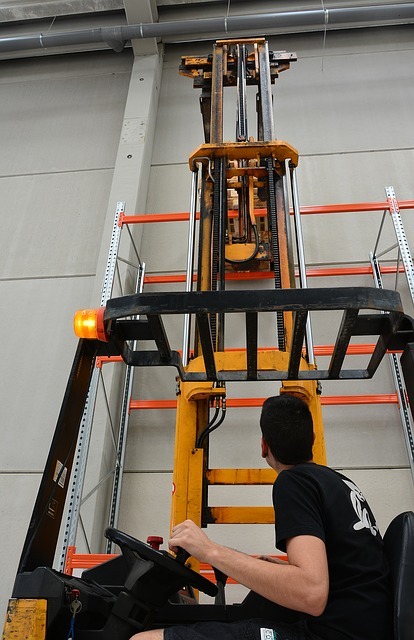 Furthermore, you can minimize the risk of workers falling off tall ladders while accessing products from a lofty section of the pallet rack. Because you can now use shorter pallet racks, your need for large, heavy-duty forklifts can be minimized. In fact, you can shift to using smaller vehicles and shorter tools inside the warehouse. 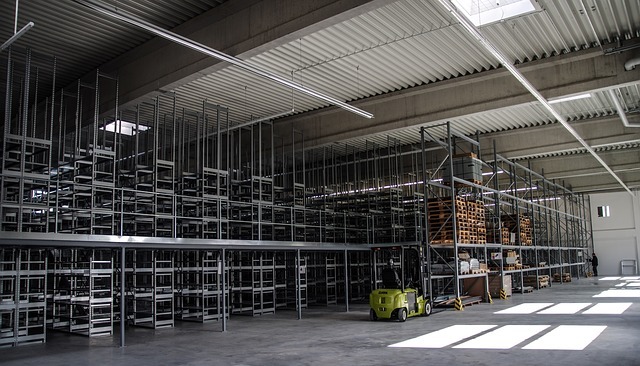 With smaller vehicles and equipment, you can now afford to have narrower pathways, which means you can build more racks, increasing the capacity of your warehouse. Unfortunately, adding a storey to an existing building (especially if it wasn’t initially designed to allow for such a major face-lift) can be both expensive and lengthy. It’s not just the cost of the whole project that you have to take into account, but the cost that entails the interruption, not to mention the need for a temporary facility where you can move your products before the construction project commences. 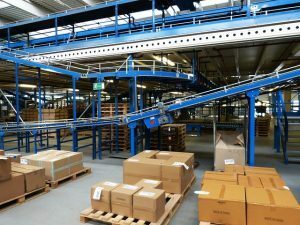 Fortunately, there’s another quicker and less expensive alternative to adding a concrete second level to the warehouse—mezzanine floor. 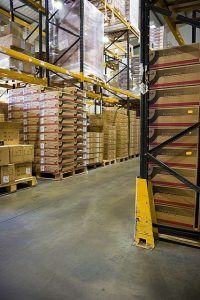 The additional level of your warehouse doesn’t always have to be fixed or made of a concrete slab that stretches from wall to wall. It can simply be a temporary structure made of steel columns and plates. That kind of structure is generally known as mezzanine. It is a free-standing intermediate floor that is partly open to the double-height ceilinged floor below. This option offers a number of benefits. A regular concrete slab is made up of more than one type of material. Specifically, it has concrete (cement, sand, and gravel) and reinforcing bars. Plus, there’s also the need for formwork and scaffolding; a huge chunk of the budget goes to these couple of processes. All in all, the construction cost can go up to hundreds of thousands of dollars depending on the size of the area to be covered. A mezzanine, on the other hand, consists mostly of plates, columns, and rivets of the same metal. The assembly or installation involves no more than riveting and welding. Since a mezzanine is made up of prefabricated materials, its installation may take no more than a few days. With enough workforce and sophisticated equipment, the whole project can finish within a day or two. In contrast, a concrete slab requires setting up of forms and pouring and curing of cement, which may last for several weeks. Mezzanines are essentially only temporary structures. This is why, unlike concrete slab, they are usually designed as either freestanding or semipermanent. Since they are not fully attached to the warehouse’s main components, they do not affect the flow of forces that keep the building stable. Additionally, mezzanines are easy to dismantle, expand, and relocate. Depending on your need, the mezzanine can serve both as an additional storage space and an office space. Instead of having a standalone office outside the warehouse, build it inside the warehouse on the mezzanine. You can extend the walls to the ceiling to eliminate the need for a separate roof. The new office may even solve yet another issue that you’ve probably been putting up with for so long—the office getting in the way of vehicles. With the office on the mezzanine, you don’t have to worry about it blocking the pathways below. Now that you have more in-depth knowledge of the role mezzanines play in a warehouse, you may be convinced to invest in one soon. Just make sure to hire the right supplier for the installation. Better pick not just a general contractor but one that specialises in new and used pallet racking systems or mezzanine floor structures, such as AGAME Universal.